Shoppe Keep 2 has just launched into Early Access! We cannot wait to hear what you think of the game! Shoppe Keep 2 is an Early Access game, so you may come across some bugs or issues. If you wish to report a bug or offer a suggestion, get in touch with us by posting on the forums. First up: just a few tips to get you started! Quests are given to you by NPCs. These allow you to unlock new items and eventually open up the gates of the town. If you find yourself stuck, talk with a few of the named NPCs. The way tax currently works is that any tax you pay, you'll have that amount to spend on upgrading the town. The more taxes you pay, the faster you can level up the town and upgrade crafters. If you rack up lots of unpaid taxes, your shoppe could close too! Customers will express their frustration at your prices if they are too high. Some will even tell you the amount they are willing to pay for an item. Many customers have different opinions on the worth of each item, so it is best to price your items accordingly. The world economy transmits data to the developers which will allow us to see what items are being sold the most throughout the community. 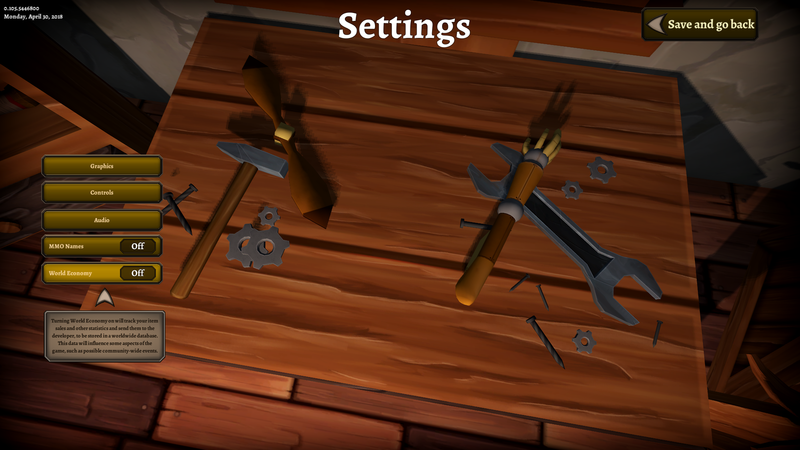 It is automatically set to off, though if you’d like to turn it on, it will allow us to see more information about what players are selling the most of and begin work on balancing the game, as well as playing around with the customers' thoughts and values of an in-game item. As you play through Shoppe Keep 2, some items will drop into your Steam Inventory which you'll be able to use in-game or trade with other players. These drop in a time system similar to Team Fortress 2. There's a 50/50 chance for the game to drop either a chest or a key. Opening a chest with a key will give you a random chance to unlock a cosmetic item like hair style or tattoo's. These items are completely tradable within the Steam community. 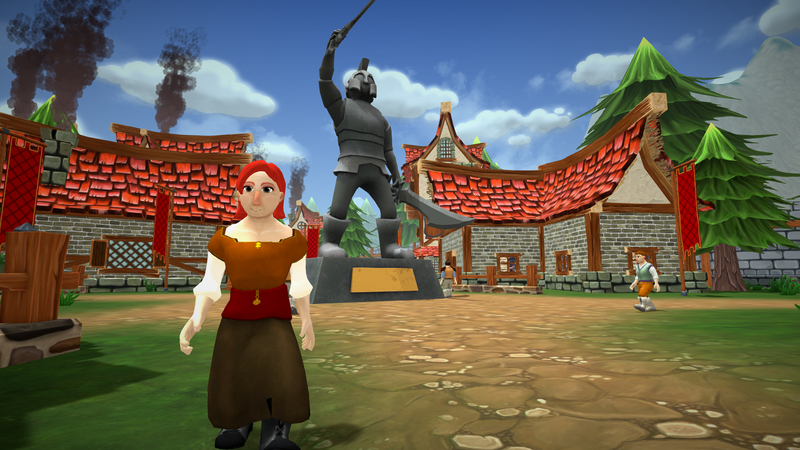 Today’s launch of Shoppe Keep 2 in Early Access is a foundation. We want to share more information with the community on what is being worked on currently. Here is the first list. ONCE this list is complete and live, we will share a new list that reflects on the current state of the game and community wishes/suggestions. This is the planned process for the rest of development. First up we’ll share information on some visual upgrades which will include new shop architecture, new trees and vegetation for the forest area and a new level tier for the town itself. We’ll also be creating additional content for players which will include new quests as well as new items to order and craft. 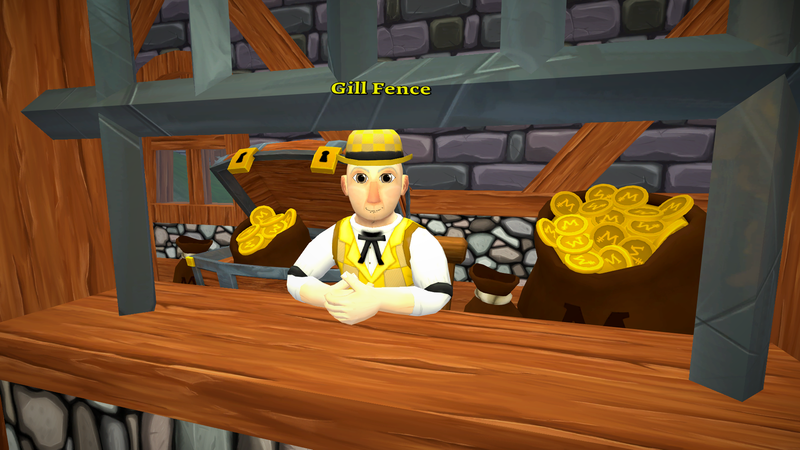 We also intend to upgrade the furniture vendor and provide him with two more furniture types to sell. One of the intended fixes already in progress is to adjust how containers work so that they are more useful in both single player and multiplayer. And finally, the biggest feature currently in development is that we will be introducing family houses that will control various businesses on the island. There will be a series of quest chains which will please and displease each house and with it a series of buffs and debuffs for your shoppe. Additionally, the houses will unlock new business ventures such as a fishing boat, mining shafts and bee keeping fields. In the coming weeks and months we'll be sharing more details via screenshots and video. Stay tuned! During the development period we will also be fixing bugs and taking on board community suggestions once we see the first wave of feedback from players. 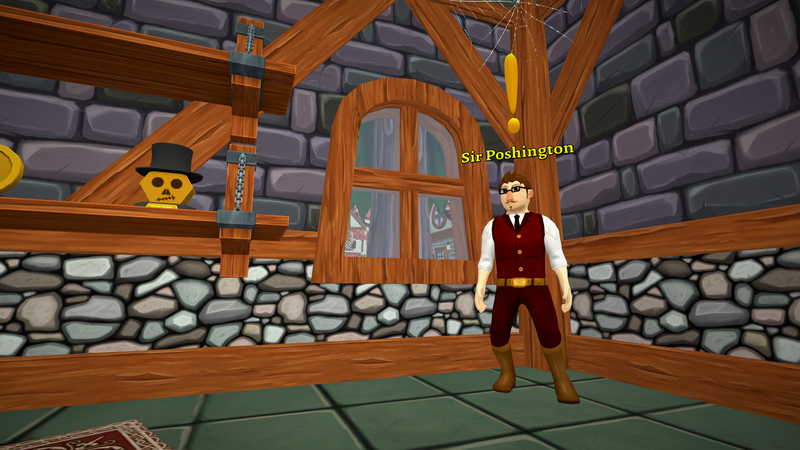 When we shared details of the rewards that players will receive if they owned Shoppe Keep 1 or Craft Keep VR, we wasn't sure whether we would be able to put them into the build for release. We can now confirm that these rewards will be live today and you'll be able to claim them when you load up your game world for the first time! 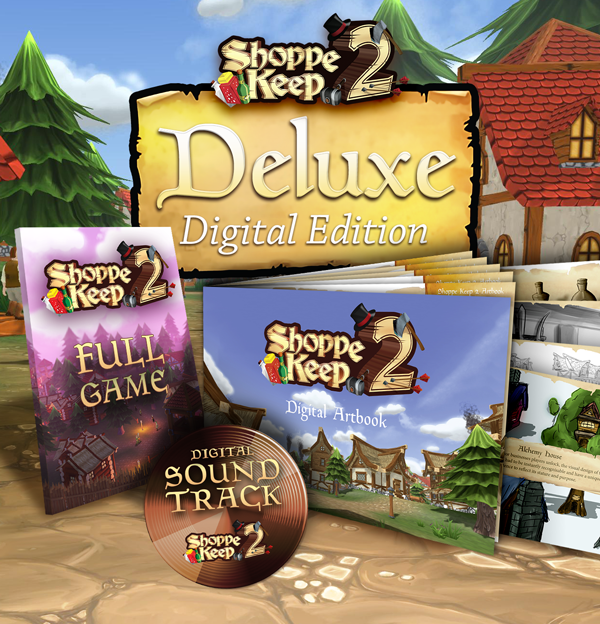 For newcomers to the Shoppe Keep franchise who want the additional items, the most cost-effective option will of course be to go for the Shoppe Keep 2 Digital Deluxe Edition. For those of you Shoppe Keep veterans, who have played the original Shoppe Keep, and/or Craft Keep VR, you should have received a Steam discount voucher for the base game at launch. The most cost-effective option for you would be to purchase the Standard Edition of the game with your discount voucher, and to then buy the Digital Deluxe Edition Upgrade – which will also be seeing a launch week discount. Additionally, we have created a special post which highlights any major bugs which players should be aware about. In today’s launch build we have just a couple that players should be aware of and the workaround which players can use while we fix the issues. When you choose to set up your game for online multiplayer you can select "public" "friends" or "private". Currently when selecting friends as your multiplayer set up, you are unable to invite friends into your game. We are addressing this issue ASAP. Current Workaround: Meanwhile, we suggest that you set up an online game with "private" or "public" as you can invite friends into your game with this setting. When playing online multiplayer, the host can use chests as intended. However, those who have joined the host's game and use a container to store items may see that their items won't be placed in the container. The host is able to use the container as normal, but the client may only be able to take out items of the container. We believe this may be an issue caused from slow connection speeds. But we are looking to address this issue as soon as we can. Current Workaround: If you are a client, do not input items into the containers. Instead drop them for the host to pick up, and then place the items inside containers instead. And that's all for now! Thank you for joining us on this journey, and we cannot wait to see where Shoppe Keep 2 goes!